International Karate Organization Kyokushin Kaikan World So Kyokushin (hereafter called the organization) welcomes dojos both in Japan and overseas with open arms. Follow the steps below from the filing of the application for membership through the completion of registration into the organization. Contact us either by phone or through the contact form on the website. Contact us at the phone number below. How we reply to you varies depending on your inquiry. At the request for the Membership Application Form, the administrative office emails the Membership Guide and the Membership Application Form to the applicant. Read the Membership Guide carefully. Complete necessary information and submit the Membership Application Form to the administrative office. Find the destination address in the Membership Guide. Once the application is approved by the Membership Committee, the applicant is informed about the subsequent formalities. Complete the formalities as instructed. Upon the completion of the formalities, the administrative office sends the applicant the Certificate of Membership. 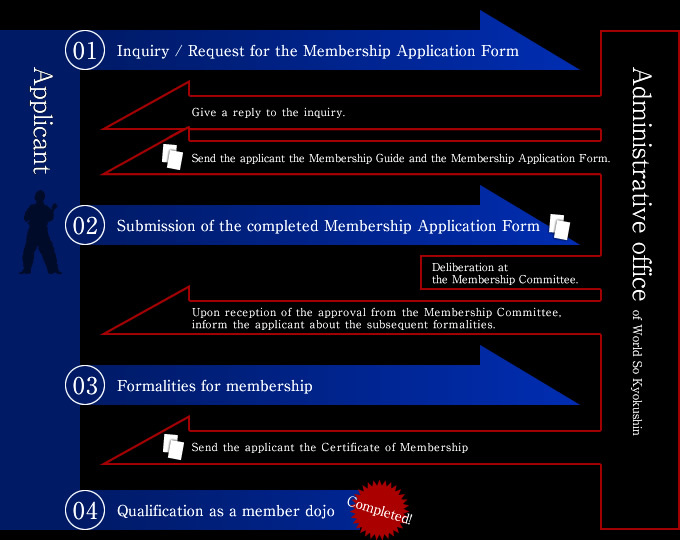 The applicant is formally qualified to start the activity as a member dojo.